Boksburg-based DCD Protected Mobility will provide more than 20 of its Husky 2G landmine detection vehicles to the US Department of Defence. According to Cornelius Grundling, GM of DCD Protected Mobility, the contract is part of a US$132 million order awarded to its US-based strategic partner, Critical Solutions International, through the US government's Special Defence Acquisition Fund (SDAF), making DCD Protected Mobility the first company in South Africa to have been recognised at this level. The SDAF was set up to facilitate advance procurement of major defence equipment which was in high demand by governments allied to the US - to reduce the long delivery lead-times for these foreign military sales. "The Husky is a central element of the route clearance package (RCP) required by many countries, demonstrated by the fact that we already deploy more than 1 500 operational units in the field," said Grundling. "This contract is an added endorsement of the quality of the Husky range, and of DCD's engineering capability to deliver over the next three years." "Due to the changing threat, route clearance has evolved into a mechanised approach where the sappers are now fully protected behind armour -which DCD provides in both its Husky and Springbuck range -to perform the detection, prodding and neutralisation function," said Grundling. "Our exposure, as both DCD and CSI, to the present theatres of war, has provided us the required operational feedback to adapt our designs and functionalities to meet the requirements of soldiers for a Route Clearance Concept." He highlighted that DCD Protected Mobility is the only company which manufactures this product and provides a full RCP solution. The Husky 2G is a versatile sensor platform that can detect, mark and interrogate landmines and improvised explosive device (IED) threats. The CAN-bus (Controller Area Network) system developed for the Husky comprises two power management modules linking the man-machine interface with the engine, transmission and other nodes via a two-wire J1939 backbone. There are three separate CAN-buses: one services critical systems and diagnostics; another services the non-critical peripherals; while the third is for inter-module communication. This allows for the capture, storage and analysis of in-time information, which is critical for operational decisions. Intense research and development at DCD has allowed the Husky to be fitted with a Route Clearance Platform Autonomous Control Kit (RC-PACK) so the unit can be operated remotely for added safety. The innovative and robust design of the Husky has meant that in the time the units have been in the field, operators have survived over 7 000 blasts, with only three known fatalities. In the event of a detonation, the Husky's components have also been engineered so they break apart in a predictable manner. This facilitates fast in-field repairs, while any damage to the system can usually be repaired in the field, increasing uptime and system availability. 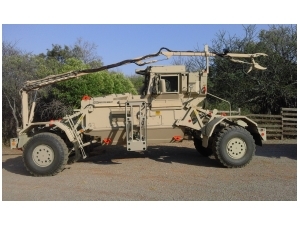 DCD Protected Mobility, a member of the DCD Group, whose roots in South African heavy engineering go back over a century, focuses on saving lives through its innovative Husky landmine detection range and its Springbuck family of armoured personnel carriers. "The demand for these vehicles -which lead the route clearance effort in mined and insecure areas, and offer unparalleled protection to occupants -has risen steadily with geopolitical instability in various parts of the world," said Grundling. "We were also able to demonstrate this capability at the African Aerospace and Defence exhibition, in Pretoria, last year, which raised plenty of interest among countries in Africa and abroad."